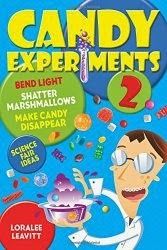 After doing three candy experiment demos in five days, I've learned I really need to pack a bunch of rags. School paper towels just don't cut it when you're trying to mop up somebody's sticky spilled experiment. And have the rags ready at hand--we wasted a lot of time running to and from the paper towel dispenser during my son's Halloween party.